https://sep.yimg.com/ay/yhst-33477391359232/carpet-anemone-green-stichodactyla-haddoni-giant-anemone-giant-carpet-anemone-6.jpgCarpet Anemone - Green - Stichodactyla haddoni - Giant Anemone - Giant Carpet Anemone Expert Only!!! 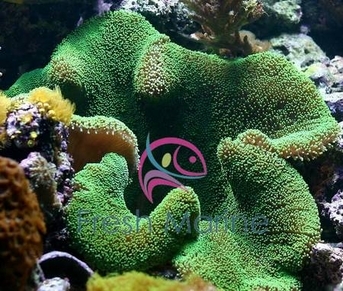 Carpet anemone would be a beautiful addition to your aquarium. Carpet anemones are for found in such a variety of colors. You can have a Blue, Brown, Fluorescent Green, Gray, Green, Yellow, Orange, Pink, Purple, or a White Carpet anemone. It usually has a variegated column, which adds to its beauty. Carpet anemone reaches a maximum size of 80 cm in diameter, though the Carpet anemones of about 50 cm are the most common. If however, you are keen on a small sized one, you can even get a Carpet anemone of sizes varying from 8 cm onwards. As carpet anemone may extend its tentacles to 1 foot, it needs a lot of aquarium space. Hence you need an aquarium of minimum 80 gallon capacity. Carpet anemones are also known to constantly move around till they find a corner of their choice. Carpet anemone has sticky tentacles. If it is able to grasp something (or someone), it is very difficult to convince it to let go without damaging it. Therefore, once it finds its place of choice it would be difficult to move it from there, and should not normally be disturbed. Carpet anemone is generally found in Indian Ocean and pacific. Its resting place is sandy bottom of a lagoon or bay; body buried in the sand, the basal disc would be attached to a rock. Interestingly, color of a Carpet anemone depends on where it was found. It is determined by the type of algae that grew there and the amount of light the Carpet anemone was getting. The blue carpet anemone is considered a prized possession. The blue one got its color from high density of light that it got. It may not require any feeding for a long time. Especially the newly purchased animal should not be fed at all. Once acclimatized, it thrives on dead shrimps, and other small sea creatures. It should be fed on these and other meaty items. Handling a Carpet anemone is laced with difficulty, however, because they have a vicious sting. Sting of a Carpet anemone may leave your finger numb. Carpet anemone can also kill and eat other fish, corals or other anemones; therefore it should be kept separate from other species. In fact, it should not even be kept with other anemones. The aggressive carpet anemone however shelters many clown fish. Therefore it would be a good policy to add one or more small clown fish in the fellow�s tank to help it feel more at home. In addition, it would also love lots of sand, simulated reef or coral rubble in the bottom for its resting place. Carpet anemone requires bright light in aquarium (about 4 watts per gallon). It would also be desirable to add some zooxanthellae ( a sea plant), with which the Carpet anemone enjoys a symbiotic relationship, to the aquarium. Light is necessary for zooxanthellae to photosynthesize. Carpet anemone prefers a temperature of 78-82 degrees F. Like most sea creatures the pH value is also very important for Carpet anemone. This should be maintained at 8.3 or 8.4. Ideal Supplements for the carpet anemone are Iodine and Trace Elements. These should be checked at least once a week. No record of any success in captive breeding of Carpet anemones is available.